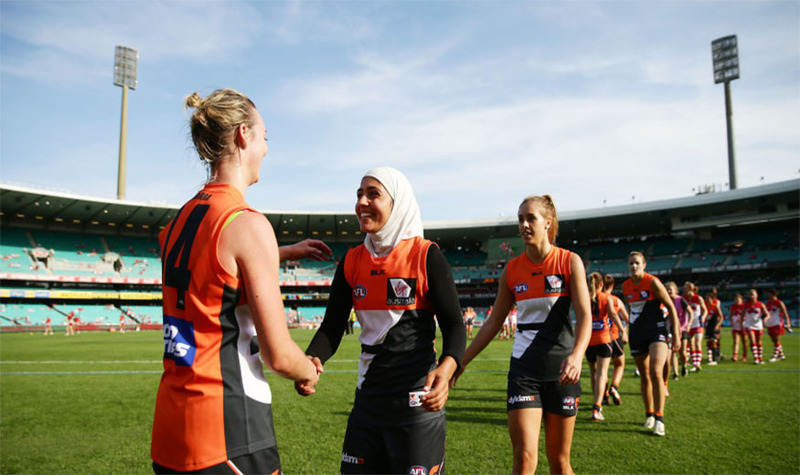 Local female player and aspiring coach Lael Kassem has been awarded the Jesaulenko Internship and will be embedded in the GIANTS’ coaching department for the next 10 weeks. A program piloted by the GIANTS last season, the Jesaulenko Internship seeks to enable people who have also migrated to Australia to follow his lead by becoming engaged in the country’s favourite sport: Australian Rules Football. Kassem plays for the Auburn-Penrith GIANTS in the AFL Sydney Women’s Premier Division, works with the Under-18s Auburn GIANTS Youth Girls and is completing a PH.D with the GIANTS Academy. “I started playing in 2011 with the establishment of the Auburn Tigers – now the Auburn GIANTS,” she said. “All my brothers played footy growing up and I fell in love with the game at a young age with my brothers being my inspiration. “My passion has always been within high performance and I’m always looking at ways to continue to learn and grow within the area. The internship is named after Alex Jesaulenko, who was born in Austria in late 1945 and after migrating to Canberra he played rugby and soccer before being asked to fill in for a friend’s AFL team. That commenced an extraordinary AFL career which included playing 279 games for Carlton and St Kilda including the Blues’ three premierships in 1968, 1970 and 1972. He also coaches both teams for 140 games, leading Carlton to another premiership in 1979. Jesaulenko is currently one of only 26 Legends in the AFL’s Hall of Fame. Across the 10 weeks, Kassem will be part of the club’s coaching group one day a week, as well as at all home games; learning game analysis, recovery, diet, training planning, sports psychology, player leadership, feedback and much more. “I think coaches have an important role to play in the development of the players both on and off the field,” Kassem said. Kassem also aspires to play at the highest level and was a train-on player with the GIANTS’ AFL Women’s side last season. Kassem is currently completing a PH.D in the field of visual search and decision making with John Quinn and the GIANTS Academy and will continue her three-year project whose purpose is talent identification in Australian Rules Football.